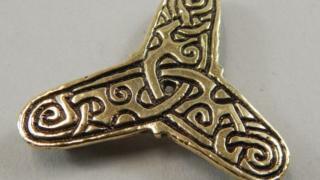 A gold replica of a Viking brooch, which was found by chance as part of a treasure hunt, has failed to sell at auction. Five objects were hidden by artist Luke Jerram for his installation Treasure City, with clues hidden in paintings at the 20-21 Arts Centre. The brooch, the first of the objects to be found, was discovered by a woman in a wall in Kingsway Gardens, Scunthorpe. The item was expected to fetch upwards of £1,200. The seller, from Grimsby, previously said she had put the item up for auction to help pay for a holiday. Each of the objects is modelled on artefacts in the North Lincolnshire Museum, and is worth more than £1,000. All five artworks in the treasure hunt, which began in February, have now been found. The second object, a gold lamb, was found in a bandstand in Brigg, and the third piece, a model of a Tudor fisherwoman, was found at Normanby Hall. A golden train was found in a hedge in Scunthorpe's Central Park. The last of the items, a replica ammonite shell, was found last week at the base of a fence post in Scunthorpe's High Street East. The clues were created by mathematician and code-setter Dan Fretwell.